You’ve hit Frost Bottom in the third Headhunter Pack for Borderlands 2. 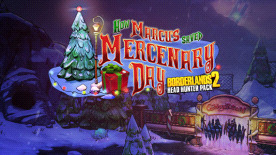 Tis the season to be giving, so help Marcus save Mercenary Day and melt down The Abominable Mister Tinder Snowflake. Escape Frost Biters, warm up Gingerton and lend Small Tim a tiny hand. There will be lots of gift-giving and loot hunting as you collect new festive heads and skins!